BackupsHot, cold and warm backup sites: Which is just right? Whether you are a cloud skeptic, an early adopter, or somewhere in between this book will help you. A business continuity strategy is an expensive proposition. In a previous post, we discussed how duplication of data and processes, the need for geographic distance and high-speed connectivity pile up costs, and how a service provider can offer existing facilities, economies of scale and cost certainty. According to research house Ponemon Institute, a minute of downtime costs the average enterprise $7,900 (all figures US). That’s a number from 2013. And since the number was 40 per cent higher than it was in 2010, we can presume the 2015 number is considerably higher. Of course, there are as many numbers as there are research reports. USA Today pegged the cost at more than $50,000 an hour according to 80 per cent of data centre managers surveyed, while 25 per cent said the cost was more than $500,000 an hour. And every enterprise isn’t the same. For some—particularly e-commerce firms and those that provide networking services to customers—it’s more expensive than others. So, your mileage may vary. Those are some steep numbers, and they don’t include the cost of detecting the cause, remediating the problem, and IT hours spent, among other things. But many outages are a result of systemic failure. Ponemon also cites UPS failure (55 per cent), exceeded UPS capacity (46 per cent) and human error (48 per cent) as contributors. Yes, we’re well over 100 per cent, but we’re talking multiple failures, apparently. And that’s a concern. It’s also possibly part of the reason that enterprise data centres have more outages than collocated facilities. Among enterprise data centers surveyed by Uptime Institute, seven per cent reported more than five outages in the previous 12 months. Only three per cent of collocation providers said the same. My theory is that it is a matter of focus and experience. The enterprise IT department doesn’t just have to run a data centre, it has to provide end user support—and end users are not technologically sophisticated enough to deal with upgrades, patches, licensing, procurement … the list goes on. Service providers such as Rogers run data centres. Some of them run dozens or even hundreds. There is a volume of lessons learned, best practices discovered and applied. So it goes, also, with your best defence against business disruption—your disaster recovery/business continuity (DR/BC) strategy. Keeping it in-house may provide a feeling of superior security and control, but it’s adding another layer to IT’s already complex job. Allocating the responsibility for DR/BC to a service provider—after negotiating a very strict service level agreement (SLA)—allows IT that bit of breathing room so the department can focus more on strategic alignment with the business and what it can do to grow the bottom line. Hot, cold and warm backup sites: Which is just right? When disaster strikes, it’s important to get operations going again as quickly as possible. If that doesn’t happen, chances are the business will fail; the U.S. Federal Emergency Management Agency says that forty per cent of businesses don’t even re-open after a disaster. And one huge part of the recovery is getting the IT infrastructure up and running. For companies that can’t afford downtime, that means maintaining a backup site. There are three main options: a hot site, a cold site, or a warm site. We’re not talking about the temperature of the room. Instead, the deciding factor is the readiness for immediate use, and the associated cost. The least expensive option is a cold site. Basically, it’s serviced data centre space; an empty room. There’s no computer equipment installed, and your backups aren’t there, ready to go. In case of disaster, you have to source and install equipment, then get it configured and retrieve and restore data. That takes time, effort, and money at the time of the disaster, but is the least expensive to maintain. Some companies cut costs by saving old servers that have been retired from the primary data centre for use in the cold site. That does save a few dollars, but may not provide sufficient horsepower – those servers were usually replaced for a reason – however, they may do in a pinch, and the benefit is that they can be preconfigured before being put on the shelf. Next in the dollar queue is the warm site. It has equipment installed and connectivity established, but may not have all of the resources of the primary site. Data may or may not be present already, but will probably not be up-to-date, so there would be a delay while current backups are retrieved and loaded. It’s quicker to get going at a warm site than at a cold site, but it’s not immediate. If you absolutely have to fire up the backup site the moment your primary site goes down, a hot site is the only way to go. It can be a duplicate of the primary, with live equipment, the same capacity, and as close to current data as possible, or it could be sized to run mission-critical operations only, depending on company requirements. Some companies operate two data centres, with each acting as the hot site for the other, and data continuously synchronized between the two, so they can do an immediate fail-over. The newest options are in cloud solutions such as DRaaS and IaaS; organizations may use managed hosting or a company that specializes in providing backup facilities to accomplish the same ends. Again, you can get anything from what’s essentially a hot site on down, depending on how much time and money you have. In any case, a hot site isn’t cheap. Rarely, two organizations with sufficient spare capacity may embark in a reciprocal agreement, in which each agrees to back the other up in case of disaster. It takes careful attention to SLAs, however, and a lot of trust. Making a decision can be difficult. Balancing budget and needs is a juggling act. 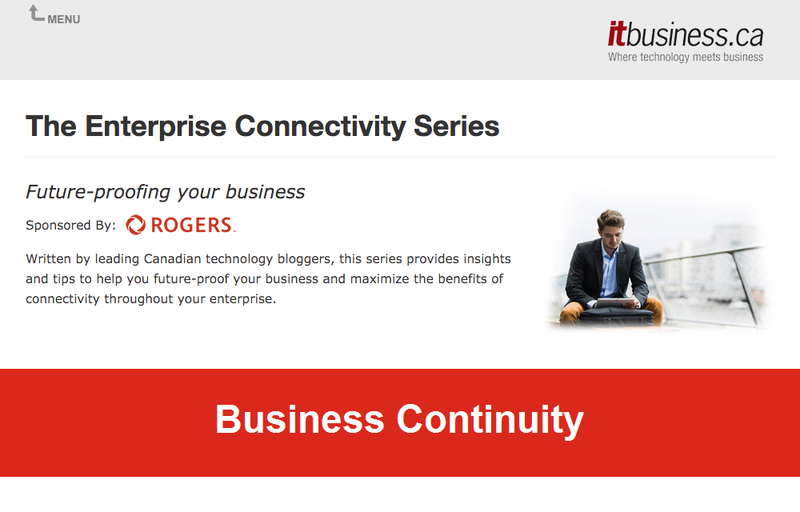 Consulting pros like the Rogers business continuity experts can help weigh the alternatives and come up with a plan that works. We all hope that we’ll never need to use them, but disaster recovery and business continuity plans are a critical part of any organization’s strategy. Without a plan, if anything happens to interrupt the conduct of business, whether it’s a fire, a flood, bad weather, criminal activity, or even a major event that makes it difficult for employees to get to the office, your company could be in big trouble. Building those plans is a non-trivial task. There’s a lot to think about, a lot of i’s to dot and t’s to cross. And they’re not just IT details. While technology is a large part of the exercise, people and facilities have to be considered as well. Fortunately, there’s plenty of expertise around to help make sure we don’t miss any critical components of the plan. Best practices abound; it’s just a matter of finding them. A good place to start is with a professional organization whose reason for being is disaster recovery: the Disaster Recovery Information Exchange (DRIE). To engage with representatives from commercial, not for profit and government organizations in providing information to support the most effective and efficient business continuity schemes for the protection of life, health and safety of individuals, and the protection of the property of organizations and the environment in Canada. Membership is open to people whose work is related to, or who are interested in, business continuity. Another great resource comes from networking giant Cisco, whose comprehensive disaster recovery best practices white paper is based on a publication by the U.S. National Institute of Standards and Technology (NIST). It walks through everything from risk analysis to document maintenance; a disaster recovery/business continuity plan is a living document that must be regularly revisited and tweaked to reflect the real world situation, and the Cisco white paper explains how to go about the task. Forbes has also provided a good overview of best practices, as told by an industry pro, which includes the admonition “remember Murphy’s Law”, Data Source Solutions offers ten best practices, and CIO magazine’s executive council has chimed in with its eight best practices for disaster recovery. If the expertise to build a disaster recovery plan doesn’t exist inside your company, and you don’t have the time or resources to acquire it, you can contract with companies like Rogers, whose services organizations contain specialists in disaster recovery and business continuity. They can help build the plan, as well as providing the necessary resources to test and implement it. You’ve crafted a fine business continuity plan for your business, one that ensures that should your organization’s feet be held to the fire, they won’t burn. You’ve followed all the best practices to a T, and thought of all contingencies. Or have you? Unless you’ve tested your ability to respond to a natural disaster or other business-threatening occurrence, do you really know how your plan, your process, and your people will respond when put to the real-life test? Fortunately, there are a number of ways to test how your business will fare should the unthinkable become the current situation. The baby steps in business continuity planning are “tabletop exercises” so called because they generally consist of imagining a specific scenario with a handful of people – either members of one specific team responsible for the response to that scenario, or with representatives of a few teams within the organization that will be called upon for a broader scenario. Think of it as a roleplaying game without the 40-sided dice, where the future of your company is on the line. It’s 4:00 A.M. and the fire alarm has been triggered at a key facility. And…… go! Members of the test talk through the scenario and measure how the plan fared. This is a great way to get started on making sure your business is ready to respond should things go wrong, and yet make sure everyone still gets to hit the local watering hole for a celebratory beverage when the day is done. Okay, so things worked out well in that scenario. But not every situation is going to be quite so compartmentalized and manageable. For your next test, it’s time to scale things up a little bit. This time, there are more people involved – perhaps people in different locations, differently affected by the hypothetically-unfolding situations. If role-playing in the previous situation was like a game of Dungeons and Dragons, now it’s time to make it a little bit more like paintball. The “bullets” may not be real, but there are certainly more concrete consequences for getting hit now. It’s time to start making the scenario – and everything around it – more realistic and as immersive as possible. And throw a few curveballs at the team along the way, because in a real disaster, odds are good that whatever hits the fan will not be evenly distributed. The tendency is to test your plan with the best people around. Instead, pull in some less-than-ideal staff members and see how your plan holds up, because there’s a decent chance that under some disaster scenarios, you’ll find yourself trying to talk Joe from Marketing who lives five minutes from the office through some reasonably technical tasks to get the company back up and running, simply because Joe was on the scene half an hour before anyone else could be. And of course, who’s to say that some key third-party services will be accessible if things go bad? Sure, maybe you’re not testing the resiliency of your phone system with this particular test. But maybe the phone system also just happens to be out as part of your makeshift disaster. Include it just to test the team’s ability to problem solve – a quality that will surely be tested should just about any disaster scenario play out for real. The types of scenarios may play out over a few hours, but may also extend over several days to assess the plan’s (and your team’s) ability to hold up over those pesky disasters that just don’t want to go away. It all depends on how ready you want your organization to be, and conversely, how unpopular you, as the person planning the testing scenario, want to be. That second level of testing will do a pretty good job of simulating a disaster and testing the ability of your business to survive. But sometimes, you really have to know how things are going to go when things go bad. This is likely a big test, involving a lot of moving parts from various departments. Have pre-determined start and stop times, and within that time frame, include a duration and path of events that is unknown to most participants. And if in the previous tests you threw curveballs, now it’s time to start throwing some knuckleballs. Maybe a spitball or two, too. Because business-threatening disasters are notorious for not playing fair. It’s time to turn the realism up to 11. If you were talking through the pre-flight safety video before, now it’s time to start putting on air masks and sending people down the slide. Maybe this time, a location is actually evacuated. Maybe you spin up your disaster recovery site for real. Putting your team in some of these situations is tough, but then are so are major business-threatening disasters. And by testing some of the scenarios that may truly test both your plan and your people, you’ll be putting your organization in the best-possible situation to survive the kind of event that can be the literal make-or-break point for any business. For the IT department, the rationale for and benefits of a robust business continuity plan can seem obvious. To secure the needed funding from the c-suite however, the case can’t be made using the language of IT. If the business side is going to fund your business continuity plan – and it really is in their best interests to do so – you need to make your case in a language they understand: the language of business. While the technology side is used to thinking in terms of security and risk, business leaders tend to take a more dollars and cents-oriented view when it comes to greenlighting investment. Business leaders are going to want to see tangible returns, and not just if and when a disaster strikes – everyone will support the investment when everything goes wrong. To get the go-ahead now though, you want to show them the business value and competitive advantage that can be realized through a robust business reliability plan. Here are four things you will want to remember as you make your pitch to the business side. The cost of business downtime can seem like an abstract thing without numbers, so it’s important you quantify both the likelihood of an outage and what it could mean to the bottom line of the business. Research from Symantec shows the average small to medium-sized business (SMB) experiences an average of six outages every year, from cyberattacks and power outages to employee errors and system upgrades. According to Gartner, the average cost of downtime for an SMB is as much as $42,000/hour. We live in the era of big data and business intelligence, and are moving into the era of the Internet of Things. The amount of data we’re storing is doubling every year, and it’s more crucial than ever to the real-time functioning of our business, as big data solutions drive actionable business decisions, often automated, in near real time. That means the cost of being without that data is greater to the business than ever before. In some regulated industries, the need for a business continuity strategy may be driven by regulatory and compliance requirements, particularly in the insurance, financial services and health care industries. Positioning a business continuity plan in the context of regulatory compliance can be a powerful motivator for business executives who understand the importance of regulatory compliance to the health of the business and to consumer confidence. It’s not an information technology continuity plan – it’s a business continuity plan. It needs to go beyond keeping the lights on to understand how the business really works, and building a plan that brings alignment to security, IT and corporate policies and strategies. The plan should be developed hand-in-hand with members of each business unit to fully understand how they work and what they need from a business continuity perspective.